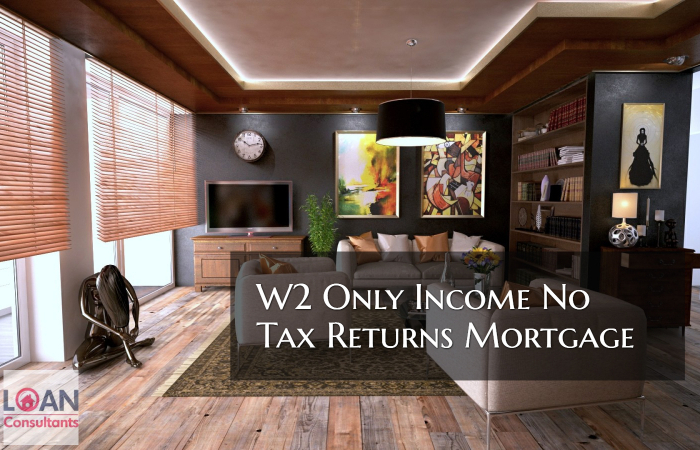 Find out how W2 Wage Earners can qualify for a home loan with W2 only income no tax returns mortgage. One of the most significant factors to qualify for a home loan is income. In many circumstances, Automated Underwriting System Approval (AUS) doesn’t require income tax returns from W2 wage earners. So, W2 wage earners are now able to qualify for W-2 income only mortgage with no tax returns that are required on conventional loans, VA home loans and FHA loans. Self employed borrowers or 1099 wage earners are required to provide tax returns of 2 years and 1099 income of 2 years. That’s because in the tax returns, expenses are written off by most self employed borrowers. Adjusted gross income is calculated by mortgage underwriters after making all the deductions. If the adjusted gross income is declining and the mortgage underwriter finds that it will probably decline in the future, then the borrower cannot use this income. In this case, borrowers will have to go to FHA to acquire a non-occupant co-borrower to qualify for mortgage. 1099 wage earners like realtors, salesman or others who wish to qualify for a home loan must present 1099 income of two years and tax returns of two years. Lenders need to see how much has been written off by borrowers in their tax returns, therefore tax returns of two years are required. Income will be calculated by using adjusted gross income. If declining income is found in two years, then the recent low income will be used to calculate monthly gross income which is required to qualify for a home loan. For W2 wage earners who are applying for a mortgage, lenders will require recent paycheck stubs of the last 30 days. W-2 income of last two years is also required, but W-2 wage earners are shown leniency in this regard. For example, if a loan applicant who is a W-2 wage earner has been employed as a part timer for two years, but later got promoted and acquired status of a permanent employee, then the permanent status will be used by mortgage underwriters to calculate income. Furthermore, if the W-2 wage earner has been employed in a company and got a hefty raise as a result of a promotion, then mortgage underwriters will use the new pay for calculating the income. If the W-2 wage earner mortgage applicant switched jobs and a higher pay was offered in the new company, then the pay of new job will be used for calculating income and they will have a better chance of qualifying for the mortgage. If the W-2 wage earner applicant is found to have gaps in employment, they will have to find a new job in the period of six months to qualify for a loan and the employment gap should be less than six months. In case, the W-2 wage earner mortgage applicant remained jobless for more than 6 months, they would be required to work in a new job for at least 6 months to qualify for the mortgage with the new job’s pay. W2 borrowers can use overtime income to acquire additional income for mortgage application but they must be able to document that they’ve been consistently getting overtime income for the past 2 years. Similarly, borrowers can also use bonus income to qualify for a loan, if they can document that they’ve been receiving bonus for the past 2 years. Child support and alimony income can also be used if the borrower can show that they will receive support income consistently for the next 3 years. To qualify for W2 only income no tax returns mortgage, borrowers must be W2 wage earners. As long as they are full time W2 wage earners, tax returns will not be required and only W2 income of two years will be required. However, it should be noted that borrowers should only be W2 earners and not 1099 earners. If the applicant has both 1099 income and W-2 income, tax returns of two years will be required. If you have been denied a home loan or have any questions about real estate or mortgage please contact the author, Matt Herbolich, MBA, JD, LLM by phone at 888-900-1020 or by email at mherbolich@usa-mortgage.com. Mr Herbolich works when you work, so feel free to contact him any time.